This Tulip playhouse is mounted on a tower base with activity slide and swing. At a generous size of 411 x 411 the tulip will provide hours of fun for your children. The Tulip Tower Playhouse is a beautifully designed split level playhouse, offering all manner of creative imaginative opportunities for play. 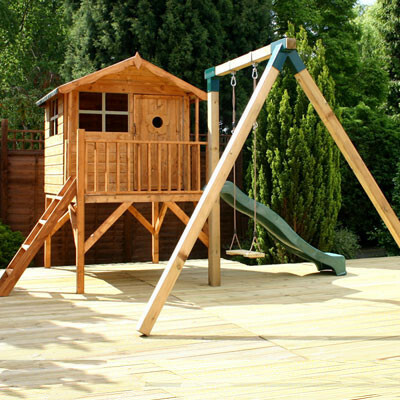 Children will love the cleverly designed split level play area, having playhouse above and shaded area underneath, ideal for a sandpit or bark chipped area. Your children, grandchildren and their friends can enjoy hours of fun in this hugely popular Playhouse, which is carefully manufactured to meet the exceptionally high safety standards of European Toy Standard EN71. The Tower playhouse is designed with an integral Veranda area. In addition the Tower features a front balcony with balustrading and an access ladder. The playhouse is supplied pre-treated with a water based timber treatment for protection against the elements. We recommend you treat the playhouse during construction with a high quality preservative for maximum durability. This playhouse comes with fully assembled panels including pre-hung doors and a fixing kit with plenty of nails and felt to complete the roof assembly.